Crosslake, MN – It was a dazzling display of underwater spy-work. Team Aqua-Vu anglers Brandon Newby and Ryan Wilson won the recent 2018 North American Ice Fishing Championship (NAIFC) and over $13,000, thanks to their relentless fish-finding approach. The two-day event (December 15 and 16) on North and South Twin lakes in western Minnesota saw 65 of the top competitive ice fishing teams in North America go head-to-head, each qualifying for the Championship via regional tournaments across eight states. For Newby and Wilson, the win cemented their status as arguably the most successful anglers in competitive ice fishing history. In the past six years, the Wisconsin anglers have earned a total of nine NAIFC tournament wins, including 2012 and 2018 National Championships and three Team of the Year titles. Remarkably, just three days after claiming the NAIFC Championship, Newby and Wilson also won the highly competitive Frankie’s Minnesota State Panfish Championship on Chisago Lake. Site of the second tournament day, South Twin Lake is known for its plentiful smaller panfish. Newby believed scoring a big weight here would be difficult. Indeed, on day one at North Twin, the duo iced 8 sunfish and 8 crappies for 13.17-pounds, including a whopper 15-inch, 1.67-pound black crappie—enough for a slim lead over fellow Aqua-Vu pros and eventual 3rd place finishers Kevin Fassbind and Nick Smyers. “Brandon and I like to go off in different directions, each armed with a drill and an Aqua-Vu and cover twice as much ice,” said Wilson. This year, the team employed a custom-made 3-inch auger bit—just wide enough to fit the camera optics, and yet small enough to disappear overnight and keep a sonar transducer out of the hole. “For stealth reasons, we don’t fish for panfish during prefishing,” he continued. “But to break up the work of constantly drilling, we like to stop and catch a pike or bass every now and then. 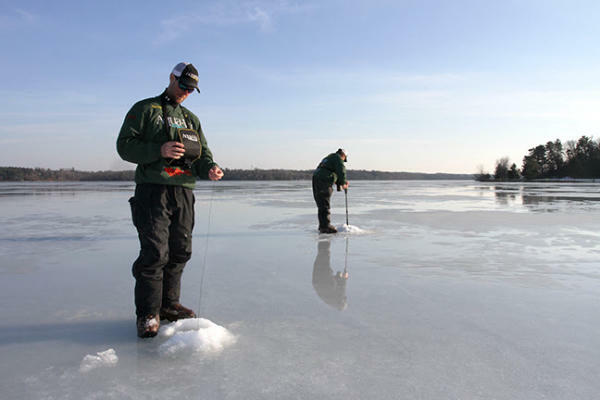 You don’t want to put any panfish on the ice because it’s just one more way to invite followers. With just an hour remaining on day-two, Newby and Wilson had their eight crappies, but only a few sunfish in their buckets. “We went into head-hunter mode, looking for one bluegill at a time with the camera,” Wilson recalled. For more details on the North American Ice Fishing Circuit, including full tournament coverage, visit their website, www.naifc.com.